What do you do when, through no fault of your own, your recent marriage has resulted in a major catastrophe that destroys your history and the very fabric of your guests' lives? This is the question MetroStage asks in their U.S. premiere of Sean Reycraft's two-person play One Good Marriage. Alternating between funny and touching the piece examines what happens when a couple has what might best be described as "the ultimate wedding disaster." It's a piece that emerges from talk show voyeurism to try and put an intimate face on and see the deeper emotions that bizarre disasters distance us from experiencing. Playwright Reycraft introduces his newlyweds, Stephanie and Stewart, on their first year wedding anniversary and from this vantage point the two share the past two years of their lives. From how they met -- each worked at the local high school in Glencoe, Ontario; she was the English teacher, he the librarian. Through their courtship -- they tried to keep it a secret, at first. To their eventual public engagement -- the students began to tease them in the halls. And finally arriving at their fateful wedding day -- forced to be held at the Glencoe Branch of the Royal Canadian Legion, since annoyingly, ultra-organized Sheila Walker had already booked their first choice 26 months in advance. And then, without revealing all that their wedding day held, they take us on the past year of grief that they have been keeping company with. It's not until the end that we completely understand what has actually happened. A spiralling technique which enables the playwright to keep our interest and also to juxtapose the light banter with the touching moments when each character breaks down from stress and emotional overload. Director John Vreeke has created a charming piece that plays extremely quickly through its 65-minute running time. The easy banter between the actors and the small gestures they make towards each other fill in the gaps to create what seems like a much larger-size production. Tracie Duncan's empty fire hall-like set brings home the void in the newlyweds' lives, as they walk around empty chairs at an anniversary party that will have no guests. Both Colin Bills' lighting and Matt Rowe's sound design add an air of comfort to the piece. In the roles of Stephanie and Stewart, Toni Rae Brotons and Marcus Kyd shine equally. Ms. Brotons brings a perky strength to Stephanie, while Mr. Kyd employs a relaxed calmness in Stewart. Each outward, public persona belies the strain of these two people's year as they have had to face what it is like to lose your past and your present in one sweeping blow. The actors' camaraderie and chemistry carries the play on swift wings and makes the whole piece a touching delight and gem of a production. MetroStage has extended this show twice and this is it's last week -- so see it while you can! Have you ever returned home after being out of town for a while -- days, maybe weeks -- and felt as though the whole world had changed? You'd missed out on something, but of course you don’t know what just yet. And everyone is different somehow, but you reason that perhaps it’s all in your imagination. For Steph and Stewart, a pair of happily married honeymooners, it’s reality. The Ontario couple celebrates their first wedding anniversary by regaling us with the tragic events that occurred after the commencement of their marriage. Like most newlyweds, the two left their wedding reception bound for a life lived happily ever after. But when they returned home a few weeks later, their lives were instead marred by tragedy and unimaginable horror. Canadian Sean Reycraft mingles the elation of marital bliss with the empty pain of death in One Good Marriage, a dark and sometimes dreary exploration of how couples cope with loss. His couple -- a pair of innocuous educators who meet, date, and marry -- must deal with this loss on a grand scale. Reycraft is a master of tease, and his promising pay-off following 65 anxious, nail-biting minutes delivers a blow that bruises beneath the skin. While the first wedding anniversary is typically a joyful occasion, a time of celebration and reflection on the first twelve months of matrimony and domestic achievement, Stephanie (Toni Rae Brotons) and Stewart (Marcus Kyd) spend it pouring over the tiniest nuances of their relationship: when, where, and how they met, how he proposed, how they planned to wed, the endless honeymoon fiasco, and finally, the indescribable trauma they both experienced after returning home. "Everyone died. Everyone’s dead. Thanks for coming, " Stephanie warns us from the beginning. But we want to know more, we need to know how. From the barrage of flowers and cards greeting them from their front porch to the inevitable yard sales from homes no longer inhabited, Steph and Stewart slowly reveal the abysmal depths of their horrific ordeal, which Reycraft has subtitled as "A Simple Tale of Glorious Grief. " A clever drama that mixes the poignancy of Craig Wright’s Recent Tragic Events with the mass morbidity of Stephen King’s Carrie, Reycraft has composed a morose valentine on how one couple survives a freak catastrophe together. Director John Vreeke doesn’t mind extending the script’s ocean liner pace. Not only does it take more than a little while to warm up to Reycraft’s bizarre storyline, but Vreeke conducts the whole affair with lingering suspense. As two newlyweds who cut each other off to finish their sentences, Brotons and Kyd treat the material as one long acting exercise, divorced from the emotions that frequently bubble up to the surface. Essentially, the actors fail to tap into the more subliminal, idiosyncratic gems hidden in the writing. Of the pair, Kyd is more convincing as the librarian whose method of handling the pain is to recall simple items, the memory of any random household object such as a plain white towel hanging to dry, a Christmas tree stand, or an unmarked coffee cup. As Stephanie, Brotons often takes liberties with her character, switching gears and personalities at will, an erratic switch that lacks purpose. Despite a mild production that never really dips into cathartic territory, One Good Marriage is an unusually provocative tale with just enough edge to render it hazardous. John Vreeke directs the two young performers, Toni Rae Brotons and Marcus Kyd, with a light touch that never draws attention to the staging, and instead, keeps the focus right on the story the two are trying to get out. The difficulty getting that story out is not a failure of performance, it is a feature of the script. Indeed, the difficulty of facing a horrendous personal misfortune is what the play is all about. Author Sean Reycraft has his characters starting over again and again as they try to explain to the audience just how their first year of marriage progressed from such a catastrophic start. The audience doesn't know until the end just what that catastrophe really was. It isn't so much what it was as it is how these two unsophisticated, sheltered and anything but worldly wise twenty-somethings coped that makes the story. The coyness about just telling the audience what happened gets a bit annoying as the short evening progresses, but the charm of Brotons and Kyd keep it from becoming a serious problem. Storyline: On their first wedding anniversary a young couple - she a high school English teacher, he the school's librarian - gather in the school's gymnasium with a group of acquaintances they hope will become their good friends. They need new friends because of a tragedy that is revealed in the course of the one-act play. 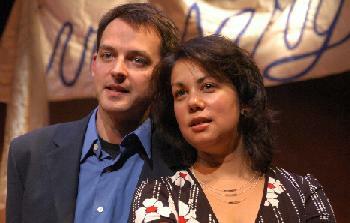 This is the U.S. premiere of this play by Canadian playwright Sean Reycraft. It was mounted last year at Toronto's Theatre Passe Muraille where MetroStage Artistic Director Carolyn Griffin saw it while on a Canadian Government-sponsored exchange program. (The Canadian Embassy is sponsoring this production.) The text is replete with the kind of false starts and incomplete details that are the mark of real life conversations under stress. Brotons and Kyd make an attractive pair of newlyweds and the chemistry between them makes it easy to slip into the belief that they have, indeed, just completed a year's worth of forming the bond of man and wife while dealing with a tragedy of undisclosed proportions . . . undisclosed at least until the end after the audience has had the opportunity to get to know and like this couple. It makes the ultimate disclosure all the more affecting. But the play isn't really about the disclosure, it is about the process the couple has gone through attempting to absorb the enormity of it and finding a way to proceed with their lives. The evening of the press opening the company had a technical difficulty which resulted in the performance being given on the attractive set that Tracie Duncan designed but without the embellishment of the lighting devised by Colin K. Bills. His lighting design was only used for about five minutes and it would be unfair to render a judgment, although the pre-show and early show glimpses were promising. The set is probably also better judged only when seen under the intended lights. But this is not a design-dependent play. Its value is in the text and the personalities of the two characters. In that it is fully satisfying in the hands of Brotons and Kyd whether under theatrical lighting or simply overhead work-lights. MetroStage, a small professional theater in Alexandria, VA, is presenting the U.S. premiere of One Good Marriage, a play by Canadian author Sean Reycraft. In its compact 60-minute running time, the play encompasses a surprising range of emotions from dark humor to pity and ultimate empathy, and the after-effect will stay with the viewer for days. The problem with reviewing this play is what one can say about it without saying too much? Carolyn Griffin, producing artistic director at MetroStage, discovered One Good Marriage during a recent trip to Toronto as part of the Canadian/Washington Theatre Partnership sponsored by the Canadian Embassy and the Helen Hayes Awards. The Canadian Embassy is a sponsor of the current production. The scene (a minimalist set designed by Tracie Duncan) is a social hall somewhere in Ontario, with scattered folding chairs, music from a portable cassette deck and a "Happy Anniversary" sign sagging unevenly from the ceiling. Stewart (Marcus Kyd) and Stephanie (Toni Rae Brotons), celebrating their first anniversary, enter and, smiling warily, address the audience. "Everybody died," Steph says. "Everybody's dead. But thanks for coming." What possibly could be going on? Why do Steph and Stewart keep repeating the same phrases, trying to stay in control, and finish each other's sentences? What is causing Steph's panic attacks, and how does Stewart know automatically how to help her through them by telling her to visualize calming, peaceful, non-threatening things? Tortuously, Stewart and Steph recall how they met as fellow members of a small-town high school faculty - he the librarian and she the English teacher (although now she has trouble with words) - their wedding, their honeymoon and, gradually, the other things they've been dealing with day by day. Appropriately, director John Vreeke has left some rough edges in the staging: moments where it seems as if one or both of the characters won't be able to continue, but then they keep on going because they have to. Brotons and Kyd give such true, close-to-the-bone performances that they are sometimes painful to watch as they have to share the unthinkable with a room full of strangers. An additional strain on press night was an electrical problem that meant that Brotons and Kyd had to perform under work lights rather than with Colin K. Bills' lighting design. They met the challenge admirably.